Will Sundays Sans George Hurt ABC? George Stephanopoulos move to mornings may not be the best use of his talents. No one doubts that George Stephanopoulos can rise before dawn, read all the major papers, and grill Robert Gibbs at the top of the 7 a.m. hour. Such questions may soon be answered if, as expected, Stephanopoulos fills the co-anchor spot on “Good Morning America” being vacated by Diane Sawyer. Stephanopoulos and ABC News are still in negotiations, but there’s hope within the network that a deal can be wrapped up sometime next week, according to an ABC source. 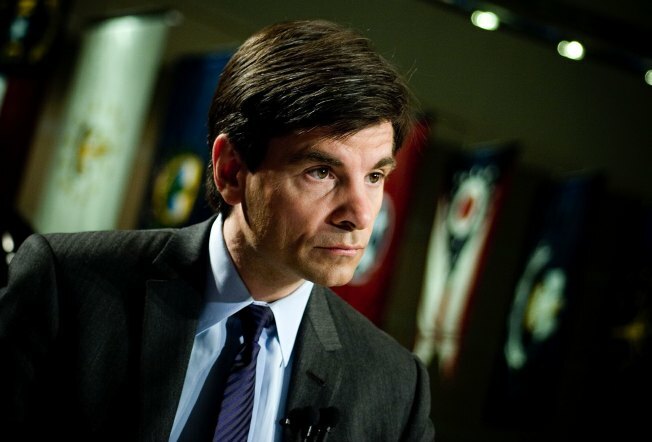 Some of Stephanopoulos’ colleagues have questioned whether “GMA” is the right fit for such a well-known political animal, and have even recommended he resist pressure from network higher-ups in New York and instead continue to build upon his considerable political franchise in Washington. But Stephanopoulos is now in a position that other television journalism stars have faced over the years, when the network brass shepherd them into roles that at first blush don’t seem the best use of their talents and expertise. Indeed, Sawyer was handed the “GMA” job on a temporary basis in 1999, but ended up spending 10 years on the morning show couch before getting the role many thought was a much better fit: “World News” anchor. Similarly, some critics have questioned other high-profile network moves in recent years, such as CBS's decision to hire Katie Couric who shined as an interviewer on Today as anchor of its evening news show. While Couric won awards for her 2008 election coverage, the show remains a distant third in the ratings. "These network teams have only got a certain number of positions to play and a finite number of people to move around in them, and sometimes they put a really good blocker in the quarterback position," said Syracuse University's Robert J. Thompson. "And blockers don't make good quarterbacks." However, Thompson — who directs the Bleier Center for Television and Popular Culture — said there's "no definition of what makes a good morning show person," pointing out that Tom Brokaw hosted "Today" before moving to evening anchor. So even though it remains uncertain whether Stephanopoulos will prove to be a successful "GMA" host, one thing is clear: he'd likely be trading in one of the most prestigious jobs in the industry to take that gamble. "For a political analyst, Thompson said, hosting a Sunday show is like making it to the Super Bowl." While Sunday mornings may be the gold standard for political junkies within the Beltway, it's actually mornings from Monday to Friday that have traditionally been more highly-prized by network executives. That underscores a distinct cultural difference between New York and Washington, where the Sunday talk shows are a ritual and their hosts from David Brinkley to Tim Russert to Stephanopoulos are rock stars. Exactly what he’ll be getting into may be a bit different than the current version of “GMA.” Given Stephanopoulos’s cachet at the network, there’s been talk internally of reformatting “GMA” around his strengths in politics and hard news—and yet, the show isn’t about to abandon Hollywood stars, home and cooking segments, or “news you can use” stories that fill the non-political portion of the show. If a couple days guest-hosting in October are any indication, it’s possible that Stephanopoulos will be off-camera for some of the lighter fare. During those two shows, co-anchor Robin Roberts took the lead on the segments dealing with new slimming undergarments and bridal fashion, while Stephanopoulos alone conducted interviews with “Omnivore’s Dilemma” author Michael Pollan and “Superfreakonomics” co-author Stephen Dubner. And at the top of the hour, Stephanopoulos, who served as communications director in the Clinton White House and is closely connected to many Obama aides, would be a formidable competitor to Lauer when both are vying for top political gets. But newsmaker interviews alone are very unlikely to push “Today” off its perch as the long-running ratings champion. It’s ironic that Stephanopoulos is considering the move just as “This Week” continues climbing in the ratings and occasionally tops “Meet the Press,” the perennial ratings leader. Last Sunday, “This Week” brought in the most viewers of all four shows; it took the prized age 25-54 demo the previous week. While there have been reports that Stephanopoulos could somehow keep hosting “This Week” along with “GMA,” it seems nearly impossible—even for someone considered as both highly-motivated and ambitious as Stephanopoulos. The unlikelihood of that happening has already led to speculation about possible “This Week” successors, including Jake Tapper and Terry Moran. So can Stephanopoulos break out of the Washington mold and make it on Broadway? Still, it remains to be seen whether Stephanopoulos can regularly break out the playful, light-hearted banter that’s less of an ingredient for Sunday morning success. So far, he hasn’t shown the kind of goofy side exhibited by Gregory, who has let loose his Washington inhibitions in his “Today” appearances by grooving alongside Mary J. Blige and taking dance tips from Chris Brown outside 30 Rock. But if Stephanopoulos does hammer out a deal before Sawyer jumps to “World News” in two weeks, he won’t be the first journalist to try navigating between hard news and the morning show routine. Brown also pointed out that even top news anchors needn’t be pigeonholed into simply reading the news on set for 22 minutes each night. Indeed, Brian Williams may don a firefighter costume on “Saturday Night Live” while Couric breaks out of the news reader role through web-only interviews and behind-the-scenes YouTube clips. Just about every major broadcast news figure has a Twitter feed, or take a less formal tone on their blogs.